Jamie is an Oakland, California-based visual artist and teacher. He was born in 1980 in Topeka, Kansas and was raised in Kalamazoo, Michigan. At age sixteen, Jamie made the commitment to become an artist. In 2002 he received a Bachelor of Fine Arts in Painting, Drawing and Printmaking from the University of Michigan School of Art and Design. 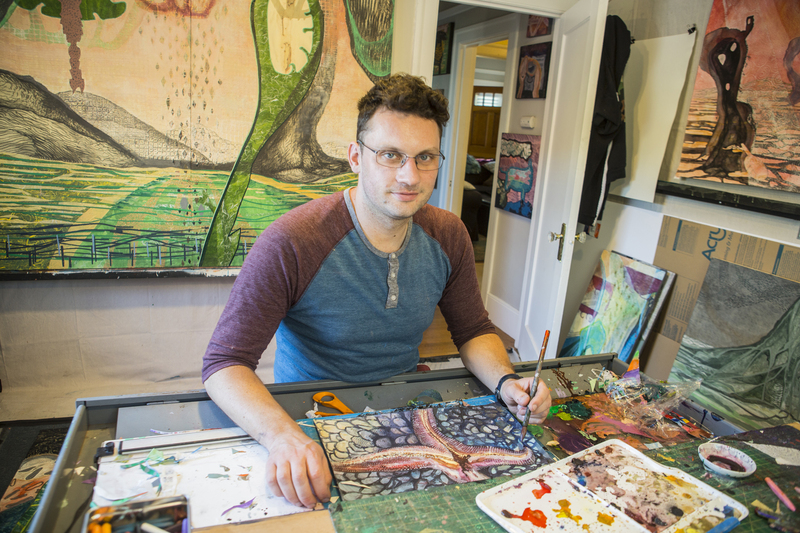 During his undergraduate study, Jamie worked with the Prison Creative Arts Project, teaching art workshops in Wayne County Men’s Correctional Facility. This experience was influenced his path towards art education. Another one of the highlights of his undergraduate study was an exchange program with Kyoto Seika University in Kyoto, Japan where he studied traditional Japanese painting. After receiving his BFA, Jamie moved to Detroit where he opened his first studio as a professional artist, Nitty Gritty Studios. In 2004, he moved to California to pursue a Master’s Degree. In 2006 he received his MFA in Painting and Drawing from the California College of Arts in San Francisco. Also in 2006, Jamie received a grant from the Center for Art and Public Life at CCA to realize his project “Young Artist Explorers” with a group of young artists in the town of Tlacolula, Oaxaca, Mexico. During his four-month residency in Oaxaca, he taught at the Casa de la Cultura in Tlacolula while creating a body of work in watercolor documenting the Oaxaca Valley. Jamie has been working as a high school art educator since 2004. From 2006 to 2012, he worked at Oakland Unity High School, a public charter school in East Oakland. He is currently a painting and drawing teacher at Skyline Senior High School in Oakland. For the past two years, he has been developing curriculum for Skyline’s Academy of Visual and Performing Arts set to open in the fall of 2016.